Strato® is the software dedicated to road design with three configurations: choose the one that’s right for you! The three versions that we offer are identical in terms of functionality and power, what changes are the axes of the design: up to 2 axes, up to 7 axes or complete. Depending on your needs, you can change to a higher version with a simple upgrade and be operational in less than 10 minutes! All design parameters are set using the appropriate dialog panels, intuitive and easy to use. With Strato® you can define elevations, enlargements in the curve, transition connectors, depending on the legislation that you decide to select. Strato® offers many automatic features that let you significantly reduce the time: traffic circles, slip road, parallel axes, are just some of the commands available! In addition, you can create and store junctions which can be adapted to any real situation. The program allows you to perform the altimetric design viewing the profile axes parallel or confluent. You can define vertical circular or parabolic connections by setting the radius of curvature, of the tangent, of the bisector, of the planimetric length of the connector. You can design livellettes of guard ditches and of supporting walls already positioned in the sections of the draft. In addition to print and export to DXF all the design elements, you can print in both graphical and numerical format diagrams of planimetric and altimetric visibility, of stopping distances and of speeds in both direction of travel. Graphical or numerical manager of the data of the ground with possibility of cutting (to shorten) at any time the sections at a certain distance from the axis, move the position of the axis and raise or lower the heights of the ground of a certain amount. You can also overturn the sections: this function in very useful when you must reverse the direction of travel of the axis. The insertion of type sections in automatic: on the same section you can add up to three project sections. The support wall are placed directly in the interactive sections of the project. The project is realized with the drawing of lines linking them or to the ground: for the insertions of these line, you can be taken as account the project heights, the absolute heights, the ground heights of the centre sections, the position of the start and end points of other project lines. Consequently, if the line (or the artifact) inserted will be equal for a certain number of consecutive sections, you can insert it automatically over the entire range of sections. The volumes to be calculated are define interactively by the sequence of lines that compose them or by internal point. 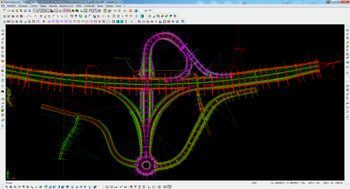 With the module dedicated to road design you can also define the theoretical sections of tunnels, built interactively or imported from DXF. These sections will combine with the design of road sections (or railway) with automatic deletion of the scarps and calculating the volume of tunnel excavation. For the management of the accounts we have provided a specific module.